Helen Margaret Ready (nee Smyth) passed away peacefully in Edmonton, at the University of Alberta Hospital, following a stroke. Helen was born in Cadomin Alberta, spending a happy childhood there and her heart remained forever “up the coal branch”. She moved to Edmonton to attend the University of Alberta where she studied Nursing (BScN 1955) and later earned a post-graduate degree in Health Services Administration (MHSA 1982). 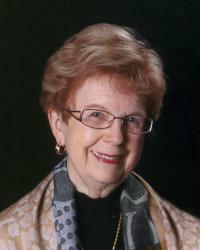 Helen’s career path took her from nursing at the Charles Camsell Hospital to public health, where she served as the Associate Director of Nursing for the Edmonton Board of Health. She was a creative and inspiring nurse, mentor and administrator. Helen was deeply engaged in her many interests. She maintained an avid interest in local and global issues, and was a spirited advocate for peace and social justice. Helen was strong and capable in the face of adversity and lent unstinting support to family and friends when needed. She was a frequent and charming hostess with a delightful sense of fun. Above all, Helen was a devoted mother and grandmother, vastly proud of her family and their accomplishments and reveling in their company. She enjoyed traveling for work and for pleasure, and maintained a life-long passion for learning about the world. Helen made and kept many, many, close friendships and had a busy social calendar. Her days were packed with activities at the Unitarian Church, choir, walking group, ELLA, and meetings of various peace organizations. Helen was predeceased by her father Edmund Smyth in 1945, her mother Anne (Smyth) Gerlitz in 2002, her stepfather John Gerlitz in 1967 and her daughter Pattey Ellen Ready in 1977. Enormously grateful for her influence on their lives are her children Marianne Tessier, David Ready, Lori (Tim) Haufe and grandchildren Jennifer, Colin and Michael Tessier and Kinnon Haufe. Helen will also be missed by her sister Barbara Higgins, her brother Reg Gerlitz and their families. A memorial service will be held Monday, June 8th at the Unitarian Church of Edmonton, 10804-119th Street, at 2 p.m. In lieu of flowers, a donation to the charity of one’s choice would be appreciated.